Published on November 4, 2017 by Martyn. Be the first to comment! A busy week looms with not one but two launches for my new solo collection of short stories, Letters Home. The book isn’t officially published until November 16th but copies have already arrived at the publishers – the Manchester-based independent, Comma Press – and will be on sale at the two events. The stories – old and new, published and unpublished – span twenty years of my writing career, and the collection marks my first publication for an adult readership since The Island of Lost Souls (Bloomsbury) in 2006, after which I switched to writing teen/YA fiction. The first launch event, billed as “An evening with Martyn Bedford” (what a horrible thought), is at the wonderful Waterstones branch in the Wool Exchange, Bradford, from 6.00-8.00pm on Tuesday (Nov 7th). I’ll be discussing the collection in-conversation with my brilliant editor at Comma, Ra Page, and reading extracts from some of the stories, as well as taking question from the audience. The event is free but space is limited so please contact the bookshop to reserve a place. Click here to visit the relevant page on the Waterstones website. Then, on Thursday (Nov 9th), I’m taking part in the Leeds Short Story Salon from 6.30-8.30 at Blackwell’s bookshop in Woodhouse Lane, opposite Leeds University. I’ll be sharing a stage with Leeds-based author S.J. Bradley and there will also be open-mic slots for members of the audience. Again, the event is free but please contact the shop to get a ticket. Here’s the link to the event on the Blackwell’s website. 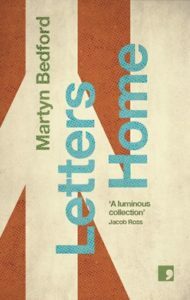 If you are unable to attend either event but would like to buy a copy of Letters Home, you can pre-order one directly from Comma Press for £9.00 (RRP £9.99) through this link.